There's a Sim game for almost everything, so today we give you eight great ideas for Simulation games. These eight activities are already fun in real life, so simulate away. These ideas are free, developers. You can have them. I'm pretty sure that queuing simulator is a real thing. ...I wish I was joking. This is one VERY much need in Hollywood: The DJ Jazzy Jeff Simulator. *that guy* "We want to make a live action re-boot of Sailor Moon, set in the USA, starring Mehgan Fox!" *that guy* What if we made April O'Neil's dad really a scientist who was working on the Captain America Formula but instead created four Green Mutant Monsters and then had to take the Serum himself to capture them? Except it turns him Evil and then Peter Parker Kills him and it's really Akward because Harry Osbourne is Also April's half-brother and now Pete can't feel comfortable going to her play with Harry. -Producer- "What about Splinter?" *that guy* Harry Osbourne! -Producer- "Ship it!" You missed out on the title of the first one! Taxi Riding Simulator is already a mini-game featured in the past couple/three Grand Theft Auto titles. 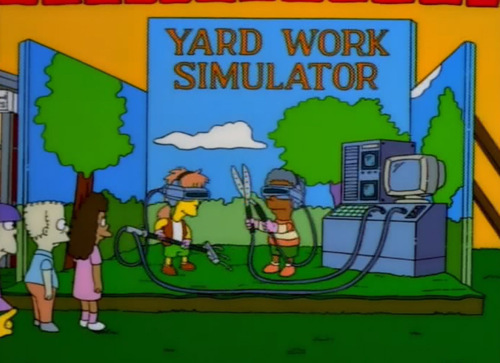 There are different ways to offer a simulator. Honestly, I was surprised this wasn't one of them. Still need to get around to making my Errand Simulator. Go to the shops to buy milk, make yourself a sandwich, clean out the attic, find that there is a time machine there, go to various points in history and the future, ride a giant, floating, all powerful jellyfish high above the desert sands in the year 4073. You know, all the usual stuff. Germans are crazy when it comes to simulator games, even though 99% of them are utter garbage. It is, but I prefer Waiting In Line 3D! Which is actually really goddamn hard, I can barely last more than 2 minutes. As for a dog-walking simulator? Call me crazy, but an Office Job Simulator has potential. If you could pull annoying pranks on all your coworkers, that is, like deliberately calling someone by the wrong name repeatedly, or staring shiftily at someone on the other side of the room over the top of the dividers, or switching the male/female signs on the toilet doors. I could go on, but I'm sure you get the picture. The kinds of things people are too nice to do in real life, but would get endless kicks out of doing in a semi-realistic video game. In fact, that game you linked is exactly the one I was talking about. I just forgot the name. I think I saw someone on YouTube I was subscribed to play it once. And I'd hardly call Nintendogs a dog walking simulator. Sure, you do technically walk them, but it's more dragging them away from bins and picking up their faeces. Which I guess is an accurate representation of walking a dog anyway... scratch what I just said, then. Nintendogs is a dog walking simulator.